The Meeting Place > Events Offers Activities > Happy St Patrick's Day! It's St Patrick's Day, so it's time to celebrate all things Irish. So why not get out your green garb and head to a St Patty's Parade ner you? Do you celebrate St Patrick's Day? How will you do it? Dan Olson, owner of the Railtown Cafe in Vancouver, woke up on Tuesday morning to find his phone inundated with angry messages from the good people of Ireland. The target of their rage? A photo of a very badly poured pint of Guinness posted to the pub's Facebook page to promote its upcoming St. Patrick's Day celebrations. "There was some irate people up there and, believe me, there were some colourful comments let's just say that Jesus Christ was brought into it on more than one occasion. One comment actually said that Jesus wept when he saw our pint of Guinness." "The picture was not representative of us. We actually do know how to pour a Guinness. It was a mistake and we take full responsibility for it." The Railtown Cafe is now extending a booze-soaked olive branch to the citizens of Ireland. 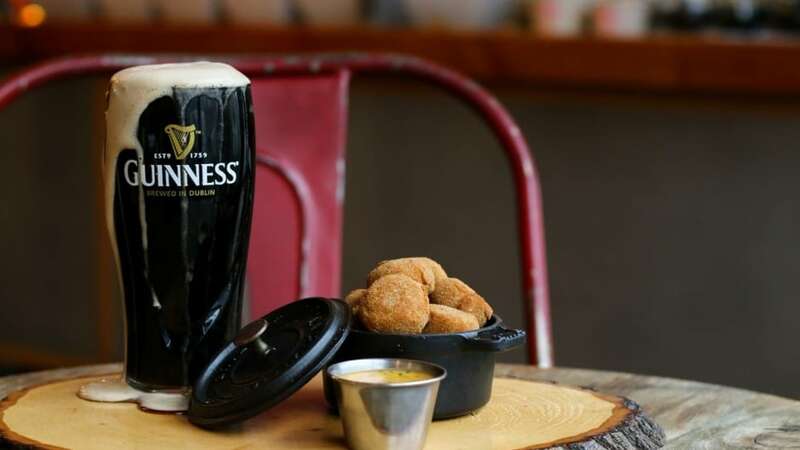 Anyone with a valid Irish passport who swings by the pub on St. Patrick's Day will get a free pint of "nicely poured" Guinness and a shot of Jameson whisky to boot. "What's St.Paddy's Day without a room full of Irishmen drinking Guinness and Jameson?" Olson said. Glendalough Monastic site. Just outside of Dublin. Happy St Patrick's Day folks! Did you really drink that poisonous looking brew Banjo? Since when did St. Patrick's Day become St Patty's Day. St. Patrick was a MALE, Patty is FEMALE. .....is the pubs enticing people to their premises to drink and play pokies.... another marketing ploy to empty your pockets. Saint Patrick's Day is held on 17 March each year, the traditional death date of Saint Patrick. What’s happening in Northern Ireland … the Belfast Telegraph’s St Patrick's Day 2017 guide to all the musical, theatrical and cultural events to get your feet tapping on March 17.
:) Enjoy your celebrations those who are. ...and since when is St Patrick's Day specifically on a Thursday?? It's on the 17th of March regardless of the day.. I have a friend born on St. Patrick's Day so his parents called him Michael, his younger brother was born on St David's Day so they called him Patrick. Sounds pretty Much like Irish humour to me except they are Welsh but it sure helps me to remember their birthdays. Hope everyone has a lively St Patrick's Day always a day that makes me feel happy. We do a St Parick's Day concert here for the benefit of our local hospital. Great fun and always a highlight of the local calendar.